Login | Edit My Account You are not logged in. 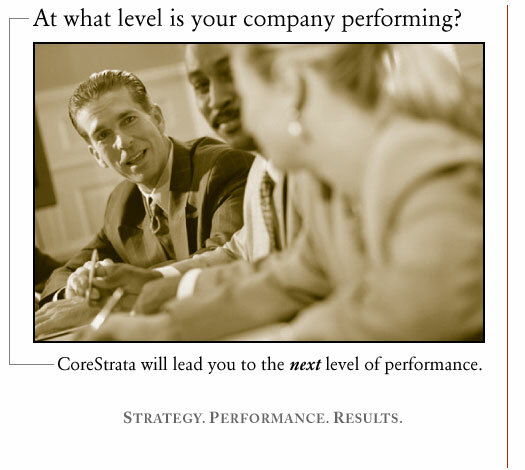 At CoreStrata, we understand the challenges and needs of today's business leaders and provide a broad and comprehensive range of solutions and services to improve the performance and profitability of your organization. We are all about Strategy, Performance, and Results! We achieve results by helping you develop and align your entire organization; your leadership and people, strategies, communications, systems, processes, controls, measurements, and the financial management necessary to gain and maintain competitive advantage! Our starting point is your organization's strategy. We assure it is well defined and that the core strategic drivers, which are critical for supporting and driving performance, are effectively in place. Website design by Papugai, copyright © 2004-2008 CoreStrata, LLC.